Ok, I had some time away. I do want to say one good thing about the previous chapter. We got Tezzeret in the mix right away. I was afraid it was going to be six more chapters of the boring heroes, and then one more chapter with the very interesting villains. But no. Tezzeret's back. And he's got plans. Well now. Our planeswalkers have been saved by the appearance of Tezzeret (and the blue chrome Phyrexians that Glissa has lent him). 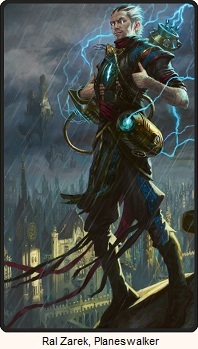 Tezzeret introduces himself, talks the big talk, and struts around like he owns the place. Koth is impressed. Elspeth is wary. He looks like an ethersworn of Esper. And he clearly is working with the Phyrexians. She only wonders why he hasn't been tainted. 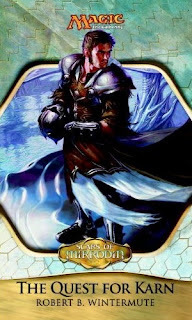 Tezzeret denies being an ethersworn, as the ethersworn are also his enemies, and claims that he's here to help them. They distrust him, so he sends his chrome Phyrexians to slaughter the hundred Phyrexians that are still nearby, knowing what to do with the presence of the newcomer. He asks if that's enough for them to trust him. All he wants to do is give them a gift. It is not. But they do ask where this gift is and where he wants them to go. The answer is deeper into Mirrodin. They ask what if they don't believe him and refuse to go, and Tezzeret tells them a secret. He'll just leave them in the vast, blinding room with no apparent exits, and their silver guide will no longer help them. The silver guide was working for Tezzeret. After telling them he has their fates in his hands, he then offers up a treat to weaken their resolves some more. Like the con man he is, he then assures them that's not what he wants to do, and he'll even offer to turn off the lights. And like the battered, beaten, and tired like they are, they cave in to his persuasion. Especially our Vulshok. "Do that and I'll follow you to the Testicles of Nyrad," Koth said. So they walk. Venser thinks to himself that he doesn't want to teleport so he can keep that power hidden from Tezzeret, as if he wouldn't already know, when he had the silver creature watching them this whole time. Must be the drugs addling his brain. Speaking of drugs, Venser takes a swig when he thinks no one is watching, but Tezzeret sees. Eventually they make their way to a trapdoor. They walk through and Tezzeret declares this is where it's safe to sleep. All three of them instantly knock out and dream pleasant dreams. Or wait... actually Venser dreams nightmares and wakes up to Elspeth shaking him. They're alone and Tezzeret is gone. Tempers flare up, and they don't know what to do, and then Tezzeret reappears claiming he was scouting. "Or planning a trap," Koth muttered under his breath. They make their way to a giant face that Tezzeret says is a Phyrexian. Some of the machines are beginning to gain sentience. They all dab some Phyrexian scent on their foreheads and the mouth on the face opens wide. Tezzeret stepped back and smiled his small smile. "Well then, who will be first?" "Only making a joke," Tezzeret said. Then he goes in. With Tezzeret taking the lead, they go in one by one and are swallowed. They slide deeper into the planet until they come out the other end (Use your imagination.) Where they face... another face. It opens wide, they enter, and the cycle is repeated countless times, until Tezzeret stands before them and says they've finally arrived, and opens up one more door. Certainly the second best chapter of the book so far. 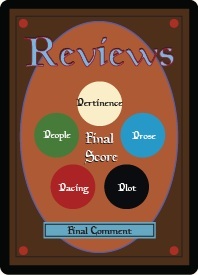 I attribute this to two things: 1) Tezzeret takes center stage. 2) There is hardly any action. Action doesn't seem to be a strength of this book, while the cat and mouse banter from Tezzeret is pretty enjoyable. Surprise, surprise! My actual favorite part of this chapter had nothing to do with Tezzeret, but with Venser. As they were swallowed the first time, the obvious thought is to wonder when they'd hit the stomach. This triggered memories of dissecting his first Phyrexian on Dominaria. He had worked on the specimen for days. When he had reached the stomach, he had been so shocked that he had dropped the charm he'd had to use to move through the half-flesh body and its metallic viscera. The stomach itself had teeth. Somehow it too had teeth as if it might someday get out of its body prison and go hunting for itself. That is a beautifully terrible image to imagine. That is just excellent. Bravo. I'm happy that I got to highlight something positive after the debacle that was Chapter 7. There are some gems worth finding in here. We have to have hit a low. Right? (Please let that be right.) And it can't get any worse.